The Masons’ Company charities have given support to Canterbury Cathedral for many years. As well as providing financial assistance for a number of apprentices in the stonemasonry team, via the Craft Fund, the Charitable Trust gives ongoing support to the outreach scheme that brings school children into the Cathedral to learn about the building, its role in society today and the ancient crafts that built it. audience. The scheme aims to introduce learners to the Cathedral and will be available to schools and community groups, particularly in areas of deprivation. A range of boxes are being produced – stonemasonry, stained glass and archives. Each will contain real and high-quality replica objects, multi-sensory material and digital media. They will link with the National Curriculum, lesson topics and programmes at the Cathedral. details of our history. 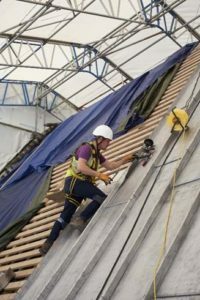 The Cathedral’s stonemason apprentices are eagerly involved in producing the stone items for these boxes and the carpenters in making them from surplus timber from the current restoration project – another strength of the scheme. The boxes will be launched at the start of the new academic year in September, together with appropriate training for teachers and accompanying literature – a massive project. In recognition of our support, Sam Royale, Manager of the Canterbury Cathedral Trust and Tony Long, Head Mason and holder of the Company Master Craftsman’s Certificate, kindly invited a party of donors and supporters of the Charitable Trust to visit the current £25+ million restoration works being undertaken on the roof and West end of the building. We started with a rather bumpy ride in the hoist to the parapet level on what was, fortunately, a wonderfully sunny although rather breezy day. In addition to a fantastic view of the Kent countryside, we were able to see the stone cleaning, restoration and replacement work close up. Then the group, which all donors had been invited to join – which included the Master and a variety of members, Liverymen, Freemen and Yeomen, all wearing suitable protective clothing – walked down several flights of scaffolding stairs to the space between the nave ceiling and the lead roof, which is being completely replaced. 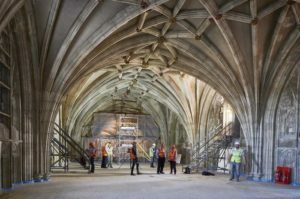 We then went down more stairs to the safety deck that has been constructed within the cathedral to provide a temporary ceiling to the nave, some 16 metres above ground level. This enabled us to see the actual nave ceiling in detail not normally possible, as well as providing an incredible bird’s-eye view of the Quire and eastern end of the building. Following a pub lunch, which gave a much welcomed opportunity for refreshment and rest, we were taken on an extended guided tour of the cathedral. Anne Marie, our guide, gave us an enthusiastic and expert overview of the site’s history – including the tragic assassination of Thomas Becket – as well as a close look at some of the unique mediaeval stained glass that is such a treasure of the cathedral. We then attended choral evensong, during which we were warmly welcomed by Canon Nick Papadopoulos, shortly leaving his post as Canon Treasurer to become the Dean of Salisbury – another cathedral with which we have a close relationship. This rounded off the day by experiencing the real reason for the Cathedral’s existence – worship in a magnificent building dedicated to the Almighty. All of us who attended are incredibly grateful to the Cathedral Trust for its generosity in arranging the day. It was a fitting way for some of the Charitable Trust’s supporters to see the results of their generosity first hand. We hope that further similar events can be organised in the future.